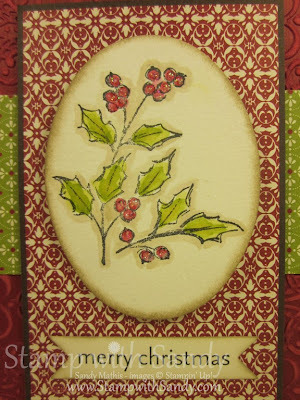 I was very excited to receive an order yesterday with lots more goodies from the Stampin' Up Holiday Catalog. But, in all honesty, I didn't actually "receive" the order. My Brown Man doesn't get to my area until very late in the day, sometimes as late as 7:00 or 8:00 pm. So yesterday I went looking for him. I scoured the streets until I located the truck and followed him around town for a bit until he pulled over. 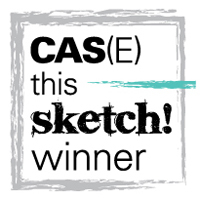 Then, success! He surrendered my package! Just so you know, my dear family doesn't know this little secret about me, that I stalk Brown Men. It may cause them a little concern. So I hope you'll please keep this among us, my blogging buddies. I brought my stash home, tore right into the package and this is what I created, using lots of new products. 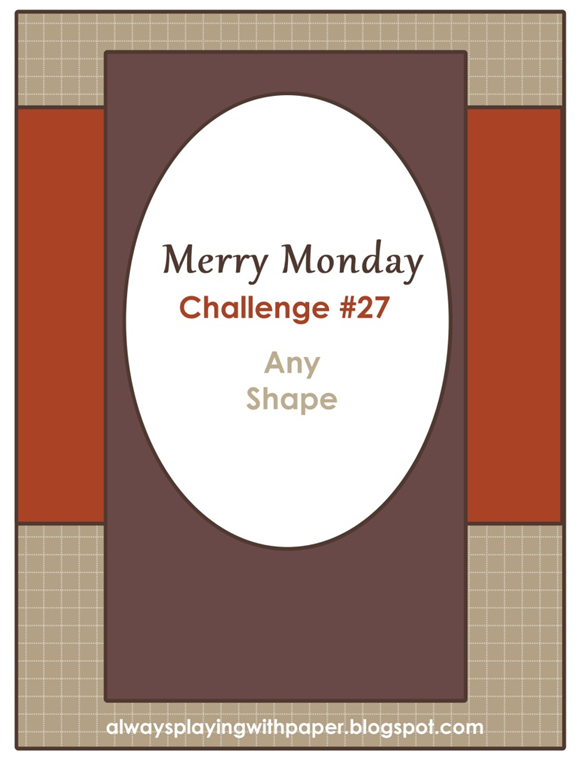 The inspiration for this project is the Merry Monday Sketch Challenge, one I am playing along with for the first time. 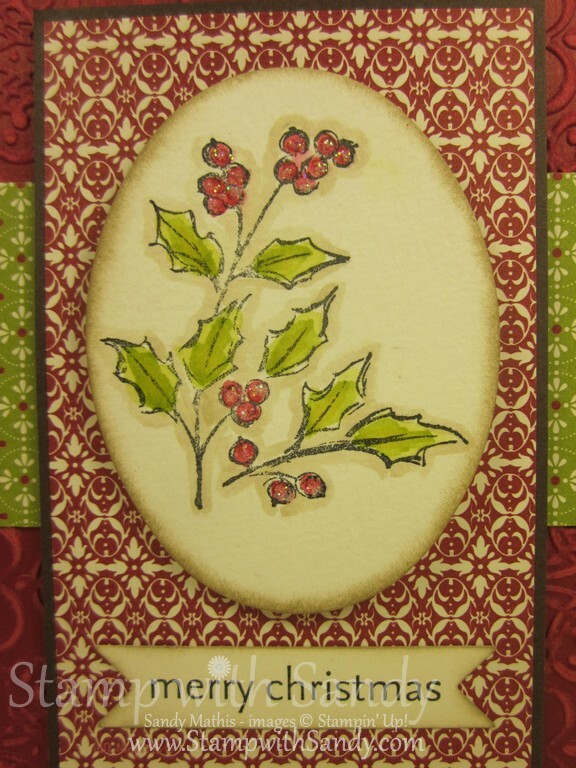 I think this is a fun blog as it challenges you to get a head start on your holiday cards. 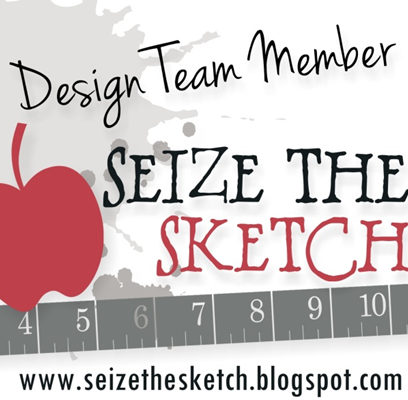 The first new product I tried out was the Core'dinations Card Stock. 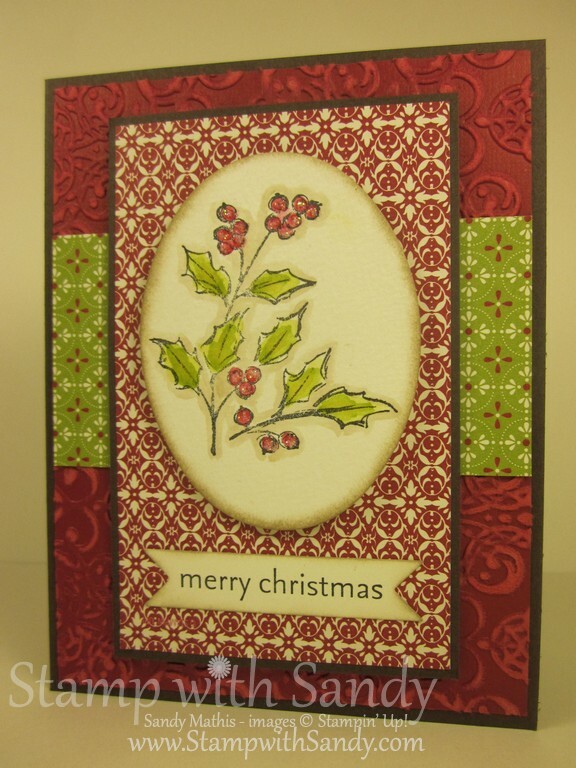 This card stock is designed to be embossed (I used the Lacy Brocade Embossing Folder), and then sanded using a sanding block, to reveal a lighter shade of color at the card stock core. Love it! The result is so soft and elegant, almost like it is flocked. Also new is the gorgeous stamp set, Watercolor Winter. 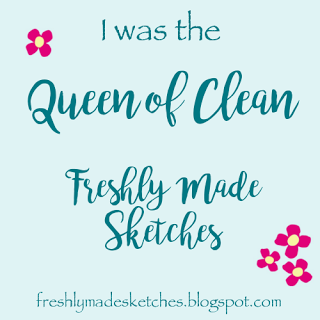 I stamped it on Watercolor Paper with Black Stazon Ink, and colored the images in with ink pads and an Aqua Painter. The Designer Series Paper is from a stack called Festival of Prints, which is a stack of 48 sheets of 4 1/2" x 6 1/2" designer paper. 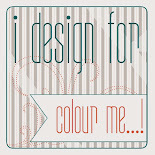 Please leave a comment; I love to hear from you! Beautiful Card! And I thought my package tracker app was a little over the top! LOL! Beautiful Christmas card, Sandy!!! Love this set & your papers! Nice job! Beautiful card, this set is gorgeous. Love the papers too. 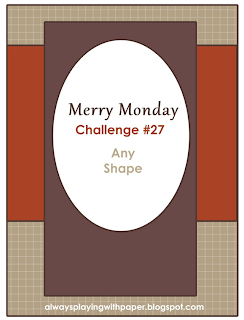 Thank you for joining us for Merry Monday this week. Beautiful card Sandy. I love the watercolouring and the DSP. You must have a wonderful Mr Brown to be able to stalk him like that. Well done. This is lovely Sandy! The water colouring you have done is perfect! Wow! Oh, Sandy, I'm giggling merrily about your stalking Mr. Brown. He comes late to our house and I never thought of stalking him, but think it's a great idea! I won't tell your family. After all a girl's gotta do what she has to do! You picked the perfect selection of papers to go with this beautiful watercolor design! Thanks for sharing with us at Merry Monday and for the chuckle. Very pretty card, Sandy. 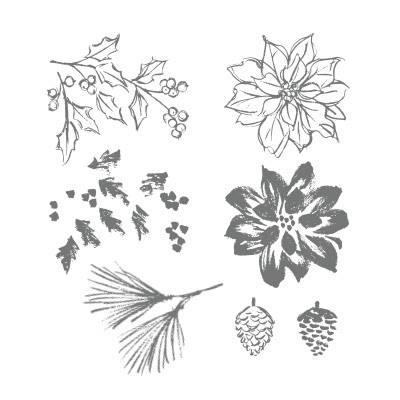 All your elements go together beautifully, and that image is a beautiful holiday reminder! Thanks for playing with us at Merry Mondays this week!